The street between Palazzo Vecchio and the Uffizi has a very unusual name: via della Ninna, ‘Lullaby street’, the same lullaby that parents sing to get their children asleep. Why has this very central street such an unusual name? When we walk in this street, we can notice – on the Uffizi wall – the remains of the church of San Pier Scheraggio: some beautiful arches from the nave that was destroyed when the street was opened. The medieval church has been partially destroyed and partially incorporated in the Uffizi palace. In the church there was a painting, a Madonna and Child, attributed to Cimabue. Popular lore says that the Virgin had a very sweet figure and she seemed to cradle the Child Jesus, to get him asleep. For this reason, the painting was called “Madonna della ninna nanna”, ‘Madonna of the lullaby’. People continued to remember this painting, even after the opening of the new street. As many other streets in the center of Florence, via della Ninna has not only an unusual name, but also an interesting story that produced it. In this case, the story is linked to that of the church of San Pier Scheraggio. It was an important church, where Dante and Boccaccio made their speeches, but it was sacrificed to a new society and a new power in town. 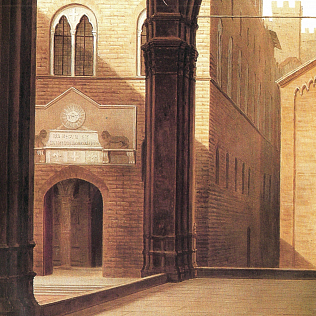 Nowadays, to observe the columns and the arches on the Uffizi wall is a very charming experience.